An evening length work conceived and directed by UMAMI Performance, the collaborative duo of Aiko Kinoshita and Aaron Swartzman, Patina was a true collaboration between dancers, musicians, set, lighting, audience, and just about everything else in the room. 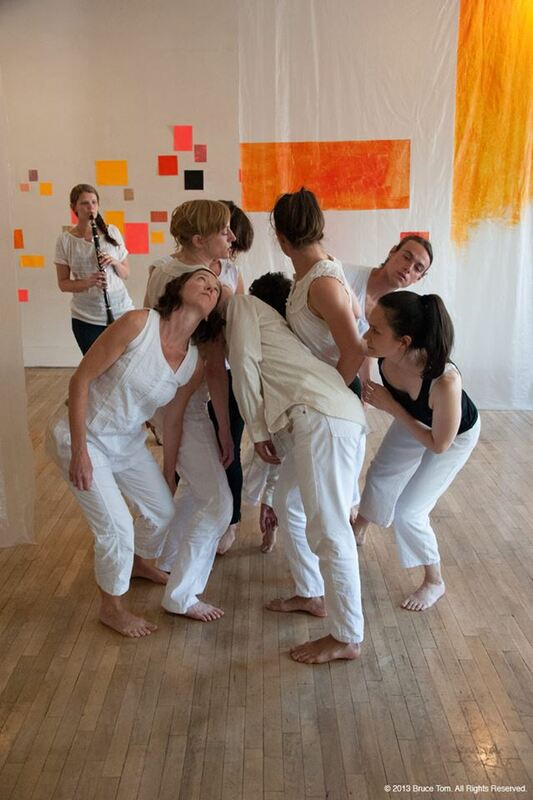 Performed at Open Flight Studio on Saturday, July 6, 2013, Patina was part of UMAMI’s larger project, Constellation Half-Remembered, an ongoing performance that plays with the idea of memory and conversations. Audience members are encouraged to see more than one performance and challenge their own memories and expectations of the piece. Each section of the larger work was and will be performed in different spaces, adding multiple dimensions to an already multi-dimensional dance. As audience members entered Open Flight, the performance had already begun. Lime green lighting filled the stairwell that was decorated with patches of blue and green paper. A clarinet player (Beth Fleenor) stood in the stairwell; audience members stopped and listened to the music as they made their way up the staircase. Another clarinet player (Amy Denio) stood in a back room, sometimes playing by herself, and at other times, interacting and communicating with Fleenor in the entryway. As viewers filed into the studio, the lighting and the mood shifted drastically. Light streamed in the open windows, jars of orange and yellow liquid decorated the windowsills, and three large clear tarps painted with orange, yellow, and black blocks of color hung throughout the studio. Dancers stood behind the tarps and audience members were invited to wander throughout the studio and observe at any angle while the dancers moved in pairs throughout the room. Patina is a term used to describe a chemical interaction when copper is exposed to heat or oxygen that turns orange-y copper to blue or green. This concept was mimicked by the change in set from the outside to inside of the studio. But the term also refers to a changing of textures, which was brilliantly displayed through the many layers and constant shifting and juxtaposition within the piece. At times, the dancers even appeared to mimic fast moving molecules, as they bounced off the walls and collided with other dancers. When the audience was seated, the stage performance portion began. The movement was full of continual undulations and gestures as dancers playfully explored each others touch or maneuvered about in and out of the spaces around them. Clearly inspired by contact improvisation, many of the sections included clumps of dancers moving seamlessly around one another, while also using the negative space between them as another partner to be explored. The dancers and the musicians were engaged in a constant conversation of movement and music, working together or challenging each other throughout. A large part of the dance seemed to be a product of reactions. Whether it was other dancers, the music, the audience, the air around them, or even the lights that shone overhead, everything in the room became part of the piece, and something that the dancers reacted to and communicated with. Much of the movement was initiated by the dancers literally tossing each other’s limbs or whole bodies, causing series of turns and swoops. The movement itself presented two contrasting concepts: vulnerability versus control and openness. While the movement was often precise and meticulous, at times, dancers covered their necks and closed themselves off as if embarrassed or uncomfortable. As the dance progressed, the mood quickly shifted from a playful conversation to a chaotic collision of bodies and space. All the while the music played a role in the on-stage interactions as the musicians chanted, sang, or played their clarinets through cascading pitch and tempi. After this extended chaos, the piece finally slowed and, one by one, the dancers began to undress. At first appearing uncomfortable with their shift toward vulnerability, eventually, their movement slowed and they seemed to relax and accept the change. They opened their arms wide or exposed their necks to the sky implying confidence and ease. Besides accomplishing a multidimensional collaboration, Patina achieved a truly constant conversation, complemented by pleasing interactions, dedicated dancers, an innovative use of space, and a successful effort to immerse the audience and involve them in the process. For more information about UMAMI Performance or Constellation Half-Remembered visit their website at http://umamiperformance.wordpress.com/ and become part of the memory.